ROSSBURG, Ohio — Coming to the finish in Wednesday night’s Eldora Dirt Derby, you didn’t know who was going to win. 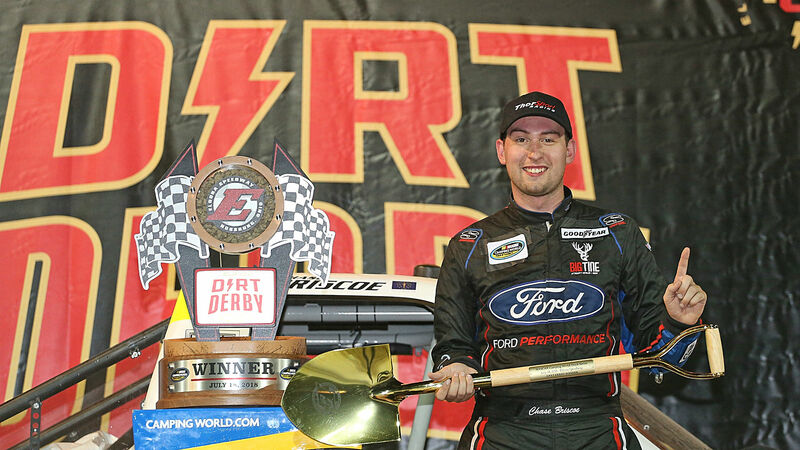 With dirt slinging, doors banging and the checkered flag waving, Chase Briscoe edged ThorSport Racing teammate Grant Enfinger to earn his second career NASCAR Camping World Truck Series (NCWTS) victory in the sixth annual race at the historic Eldora Speedway. In a one-off race with ThorSport, Briscoe, on newer tires, took advantage of a Lap 145 restart to pass leader and Toyota Racing Development protégé Logan Seavey, but the event’s final caution within three laps of the finish set the tone for the exciting finish in NASCAR overtime. Retweet to congratulate Chase Briscoe on his #EldoraDirtDerby WIN! For Briscoe, a Ford Performance development driver, it was his second straight win after earning his first career victory last November in the Truck Series season finale at Homestead-Miami (Fla.) Speedway with Brad Keselowski Racing. Spending much of his childhood in the grandstands of Eldora watching his grandfather compete, Briscoe became emotional talking about the significance of winning in his second Eldora Truck Series start. After the race, Enfinger said if the roles were reversed, he would have raced Briscoe the same way. Dirt stalwart Stewart Friesen recovered from a Lap 28 spin to finish third while defending Eldora winner Matt Crafton took fourth and three-time NCWTS winner this season Brett Moffitt rounded out the top five. Noah Gragson, earning his spot into the field through the last-chance-qualifier, finished sixth, John Hunter Nemechek claimed seventh, and Seavey, who led 53 laps in his debut, slipped to eighth on older tires. “I’m not sure there was much I could’ve done there,” said Seavey. “Right at the beginning of that second stage, you could kind of feel the track was getting a little abrasive and maybe taking a little rubber off the tires. My truck gained a lot of grip there in the second stage and I just slowed down because I knew everybody was going to take tires and I had already taken mine. “I assumed I had to try to take as much as I could, but at the end of the day, you know we had 50 more laps and I think just overheating the tires and got kind of eaten up there those last couple restarts. 1. (3) Chase Briscoe(i), Ford, 153. 2. (9) Grant Enfinger, Ford, 153. 3. (5) Stewart Friesen, Chevrolet, 153. 4. (4) Matt Crafton, Ford, 153. 5. (12) Brett Moffitt, Toyota, 153. 6. (27) Noah Gragson, Toyota, 153. 7. (26) John Hunter Nemechek(i), Chevrolet, 153. 8. (7) Logan Seavey, Toyota, 153. 9. (19) Justin Haley, Chevrolet, 153. 10. (14) Nick Hoffman, Chevrolet, 153. 11. (22) Ty Dillon(i), Chevrolet, 153. 12. (17) Max McLaughlin, Chevrolet, 153. 13. (13) Tyler Dippel, Toyota, 153. 14. (8) Chris Windom, Toyota, 153. 15. (6) Sheldon Creed, Chevrolet, 153. 16. (29) Johnny Sauter, Chevrolet, 153. 17. (25) Jeffrey Abbey, Chevrolet, 153. 18. (11) Austin Self, Chevrolet, 153. 19. (28) Tanner Thorson, Chevrolet, 153. 20. (15) Myatt Snider #, Ford, 153. 21. (21) Austin Hill, Chevrolet, 153. 22. (2) Todd Gilliland #, Toyota, 153. 23. (31) Wendell Chavous, Chevrolet, 153. 24. (20) JR Heffner, Chevrolet, 152. 25. (30) Justin Fontaine #, Chevrolet, 152. 26. (16) Justin Shipley, Ford, 151. 27. (32) Dalton Sargeant #, Chevrolet, 151. 28. (24) Cody Coughlin, Chevrolet, 150. 29. (1) Ben Rhodes, Ford, 150. 30. (10) Ryan Newman(i), Chevrolet, 149. 31. (23) Kyle Strickler, Chevrolet, Accident, 145. 32. (18) Norm Benning, Chevrolet, Accident, 144. Average Speed of Race Winner: 46.131 mph. Time of Race: 1 Hrs, 39 Mins, 30 Secs. Margin of Victory: 0.038 Seconds. Caution Flags: 9 for 41 laps. Lap Leaders: B. Rhodes 1-26; S. Friesen 27; B. Rhodes 28-45; C. Briscoe(i) 46-91; L. Seavey 92-144; C. Briscoe(i) 145-151; G. Enfinger 152; C. Briscoe(i) 153;. Leaders Summary (Driver, Times Lead, Laps Led): C. Briscoe(i) 3 times for 54 laps; L. Seavey 1 time for 53 laps; B. Rhodes 2 times for 44 laps; S. Friesen 1 time for 1 lap; G. Enfinger 1 time for 1 lap.